A friend recently gave me a lovely gift of her homemade blackberry jam. I have to confess some evenings I have been just having bread with this jam as my dinner! We were chatting about picking blackberries and I said I got a notion to make a blackberry crumble. She gave me a tip to pre-bake the crumble topping so that it stays nice and crisp. Whatever about her gorgeous jam, I will be forever grateful for this tip. Thanks Fionnula! 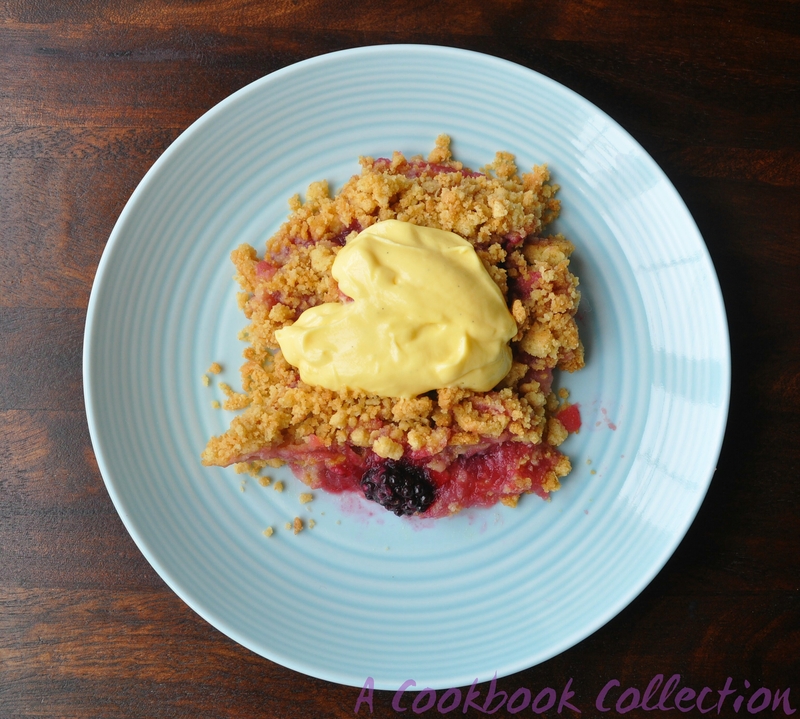 I like a lot of crumble on top of the fruit, you can use less if you wish. 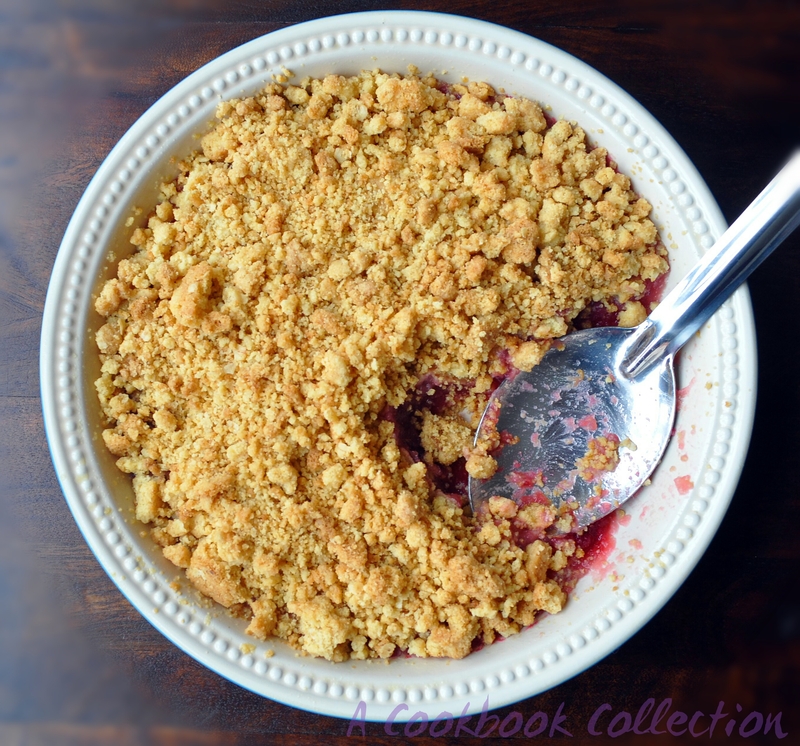 The problem when you have a lot of crumble is that it can get stodgy while baking. Pre-baking the crumble solves this, it stays wonderfully crisp and crunchy. 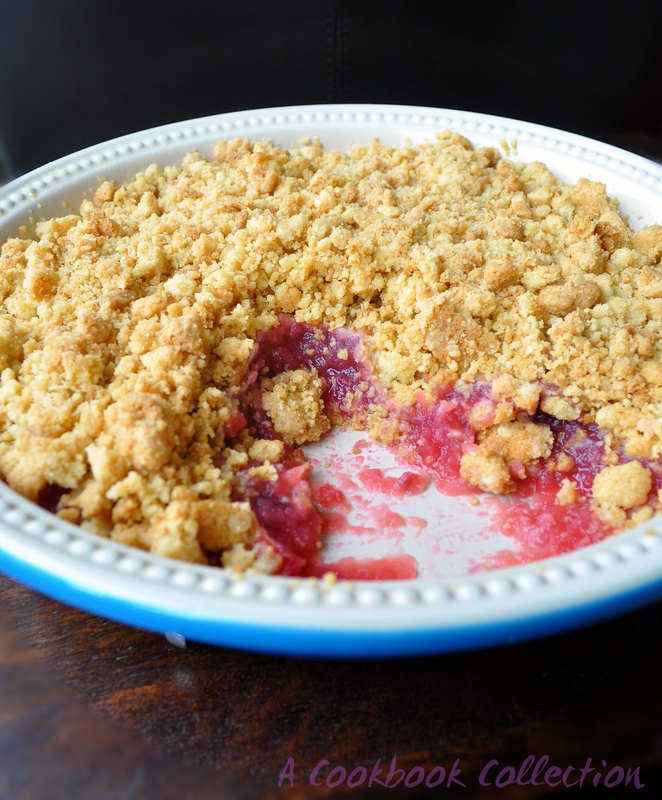 While you are making the crumble you can double up the topping and store some in the freezer. This way you can easily make one when you want or you can just use a little at a time and make little individual crumbles in ramekins. You can really use any fruit you like, I usually stick to old fashioned apple. I loved the addition of blackberries here and even the berry hater in my life enjoyed it! Now, I like my apples really stewed, like baby food stewed. If you like them more chunky then don’t cook them for as long. You could also add cinnamon as a flavouring either to the filling or the crumble but I prefer to use vanilla. If you don’t have vanilla sugar use a teaspoon of caster sugar and half a teaspoon of vanilla extract instead. I have used a mixture of caster and Demerara sugar in the topping as the Demerara is larger and gives it a nice crunch. If you don’t have it use all caster sugar. I have added a handful of oats but you can leave them out altogether or use more and cut back on the amount of flour. Anything goes really! Mix the flour and sugars together. Rub the butter in with the tips of your fingers until the whole mixture resembles rough breadcrumbs. You could use a food processor to do this but it only takes a few minutes so save yourself the washing up. Mix in the oats if you are using them. Line a baking tray with parchment paper and spread out the crumble mixture evenly on top. Bake for about 15 minutes until the mixture turns a light golden brown. Take out of the oven and set aside. While the topping is baking make your filling. Place the cubed apples into a saucepan with a splash of water and the vanilla sugar. Cook over a medium heat until they are almost cooked to the consistency you like. Add the blackberries and cook for a further couple of minutes. Stir through and taste to see if you need more sugar. Grease a 9″/23cm pie dish with butter and pour in the filling. 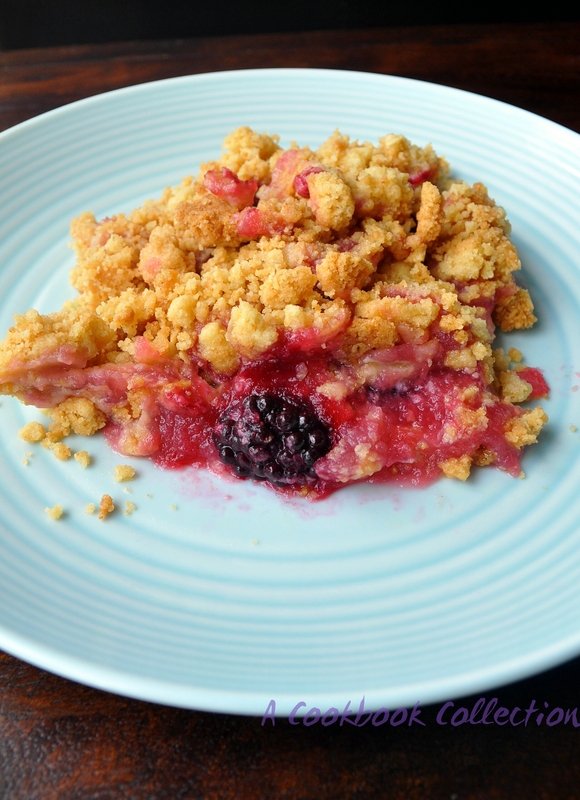 Break up the crumble topping and spread it over the apples and blackberries. Put the dish back into the oven for 10 to 15 minutes just to warm through. Serve with custard or vanilla ice cream. 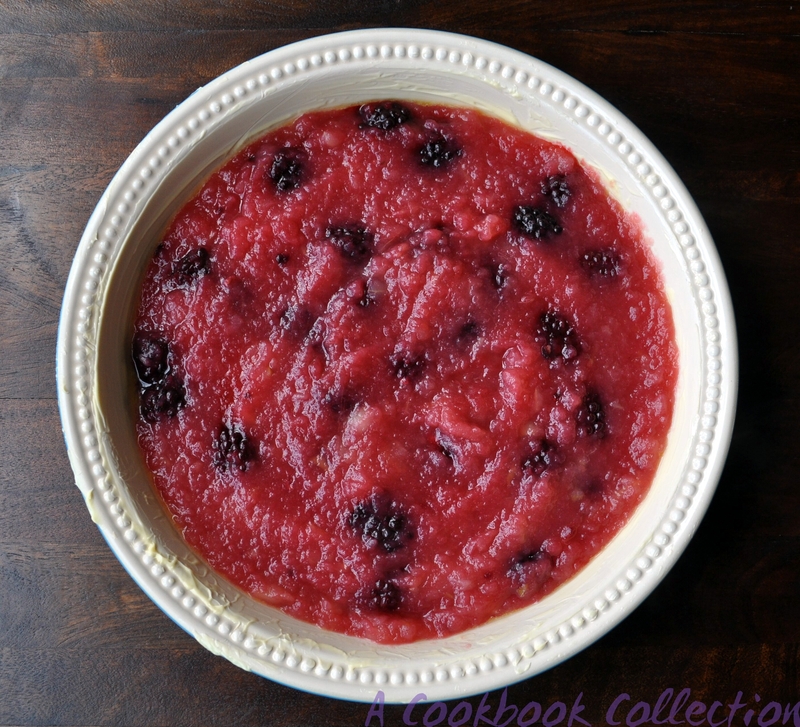 See some more ideas for using blackberries on Bella’s blog and on Melissa’s blog. Sssh, I do the bread and jam thing too! 😉 Sometimes it’s all about the simple things! That looks very tasty indeed. I could do with a slice right now.